Jaye Albright and Stephanie Winans join forces to discuss Integration in a Digital Age. It’s more than just on-air staff in a studio, it’s your website, staff blogs, tweets and EVERYBODY’s doing it. Jaye and Stephanie team together to discuss the how to’s of social media and more importantly how to get results. Broadcasting Has ALWAYS Been Social with Jaye Albright: Top 40 Radio was invented by an astute programmer who observed music fans interacting with a juke box. When CB Radio was hot in the 80’s, we all had one in our control rooms. The request line has been a big part of radio for more than five decades. 5 Steps to Creating a Killer Social Media Strategy with Stephanie Winans: Whether you’ve never had a plan to begin with or need to evaluate your existing efforts, these actionable tips will help you create a Social Media Strategy that will brand your station, show, drive ratings and web traffic. Stephanie and Jaye will encourage everyone in attendance to share their perspectives in this fast moving morning of fresh ideas. You will walk away with advice to increase your stations’ social media presence and ultimately encourage traffic to your website and stations. Connection 2012 will also feature a Programming Panel, moderated by Chris Byrnes, President, Byrnes Media, and includes Julie Adam, Vice President, Programming, Rogers; Rob Farina, Executive Vice President, Content, Astral Radio; David Farough, VP; Brands, Programming & New Media, Corus Entertainment; and Steve Jones, Vice President, Programming, Newcap Radio. This accomplished group of programmers will discuss some of the key programming issues facing the industry today. The Ontario Association of Broadcasters fall conference, CONNECTION 2012 will be held on Tuesday, November 6th in Toronto at the Westin Bristol Place Hotel. See Jaye & Stephane, Integration in a Digital Age for $99 members/$129 non members including Luncheon ticket. Full conference tickets including Gala Awards Dinner tickets are $199 for members, $249 for non-member. More information and registration available at www.oab.ca. 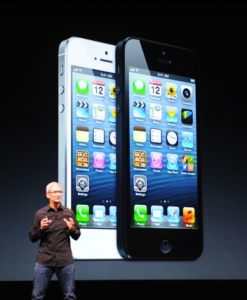 The iPhone 5 was officially announced at the Apple Conference in San Francisco today (Sept 12th). Here are some of the features of this phone. It will be the world’s thinnest smart phone at 18% thinner than the 4S at 7.6mm, and 20% lighter at 112 grams. It will be faster using the LTE platform with a new A6 chip so pages, audio, and video will load faster. The screen is larger at four inches, and will be 1136×640. Battery life is 8 hrs with 225 hours standby. An improved camera and a better audio system and improved speakers. The new IOS 6 will include Apples own map system called Forstall. Pricing in the USA – $199 for 16 gig, $299 for 32 gig and $399 for 64 gig. Orders on-line will be accepted from this Friday with delivery by the end of September in the USA. Canada release dates to follow. Apple also announced a new version of iTunes with iCloud built in. iTunes Store integration lets you browse other albums from within an album. The arrival of the iPhone 5 may be the biggest product for Apple to date and will likely result in an even greater market share for Apple. This is another reason to have an application for your radio station. Call ByrnesMedia and we can build you an app for your radio station. On 7 May, 2012 in Toronto, the Commission considered 17 applications for new radio stations in Toronto. At the CRTC hearings in Ottawa yesterday (10 September 2012), President of Bell Media Radio Chris Gordon told the commission that if they approve the sale of Astral Media to Bell the following stations will be sold ending months of speculation as to which station would be sold in order to meet the current ownwership regulations. The hearing continues with a decision expected within the next few months. At this hearing, we will be reviewing BCE’s application to acquire Astral Media for $3.3 billion. This is a large transaction that could have a significant impact on the Canadian broadcasting sector and the broader communication system. In fact, it could affect all Canadians and we at the CRTC need to make sure that the parties clearly outline why this is a good deal for Canada. This proposed transaction has attracted a great deal of attention across the country. This is not surprising since all Canadians have a stake in its outcome. In recent weeks, thousands of Canadians have shared their views with us. We have read with interest the more than 1,600 comments and 8,000 form letters that we have received, all of which have been placed on the public record. QM-FM regained its number one ranking by increasing it’s share by 1.1. The CBC remained strong, but fell to second. CKNW followed course and still sits third. The Beat softened slightly but hasn’t moved from the number four position. Country did extremely well in the last book. JRfm added 2 full shares and jumped from seventh to fifth. JR’s improvement dropped Virgin to sixth, however their ratings were flat. The rest of the market was stable, except for rock, which was down CFOX, but up nicely for Rock 101. CFOX-FM Vancouver 3.8 4.4 4.1 4.0 3.8 4.2 4.1 3.6 1,386.9 1337. CJAD remains where it seemingly always has been – the top of the Anglo Montreal market. Virgin had a very good summer. It gained over 3 shares and is secure in second spot. Cogeco’s The Beat went the other way, however, but still stays third. CHOM was up slightly, but is still fourth. Average Daily Universe – The average daily universe for the analyzed period. The universe is expressed as daily averages because it changes slightly daily as the in tab changes. Country 105 is back on top in Calgary. After suffering a number of poor books, they are finally back where the often have been in years gone by. They added 1.7 shares and saw their rank move up from third. The CBC dropped to second and they softened .6 of a share. News/Talker, AM 770, had a soft summer, which is not unusual for the station. They moved down to third. Calgary’s Greatest Hits, XL103 FM, had a good showing. They were up over a share and raised their market position two notches to fourth. Virgin is the leading CHR in Calgary. They had a solid 7.7 and remained fifth. Lite 95.9 switched places with XL and dropped down to sixth, although they only showed a .4 share decline. On the rock side, Q 107 showed strength. It went from a 4.8 to 6.2 and leapt from tenth to seventh. Following close behind were their competitors, Astral’s CJAY, which had a flat book and remained in eighth. What a summer it was for Rawlco and their Now! Radio. They added almost 2 share points and jumped from fourth to first in the market. Perennial leaders, CHED, dropped to second, although they only saw a .4 share decline. Newcap’s Capital FM also dropped a position and softened by .3 of a share. CISN has had an up and down year. The country station started the year strong, but has declined ever since. Their current 7.9 puts them in fourth position. Rogers-owned Sonic continues to win the rock battle and showed an increase to 6.9, while remaining in fifth spot. Close behind at a 6.5 is The Bear. Their market position also remained unchanged. Up is steady at seventh and K-Rock had a good book increasing by almost a share and moving up a place to eighth. CFCW and Joe had soft books, while the remainder of the stations were more or less flat. CHFI continues to hold the number 1 position in the nation’s largest market, although their lead has shrunk to 1.1 shares as they shed just over that amount from the previous ratings period. This is the lowest showing for CHFI in quite some time. CHUM-FM, on the other hand gained over a share, but remains in second place. The CBC also saw their share drop, but still hung on to third. Virgin is winning the CHR battle in the market. They added a share and half and moved up 2 notches to fourth. 680 News continues to show stable numbers and was also up, but still dropped a slot to fifth. Q-107 dropped a share and two places to sixth. Boom showed an increase, yet is still well below where it was last year. It moved up to seventh. The remainder of the market was largely unchanged.